A theme that overarches all such models is that they need to be fast, accurate and robust. The models need to be reasonably fast to provide actionable results in meaningful time, need to be accurate for the user to rely on and need to be robust in scenarios where the data is adversarial. The following discussion is particularly inclined towards solving for robustness while not significantly impacting the other two metrics. Talking of adversarial data, it could come from error introduced during manual sampling or extrinsic factors like noise. In other cases, it could just be the nature of the data, making it less predictable. Data samples which don’t follow the general “trend” of the data are known as outliers and generally introduce an unwanted outcomes including results being inaccurate. The points are represeted in the code below by variables \( x \) and \( y \) consisting of 100 randomly generated points. I’ve chosen one-dimensional data as it is easy to visualize and understand the implications of changes. 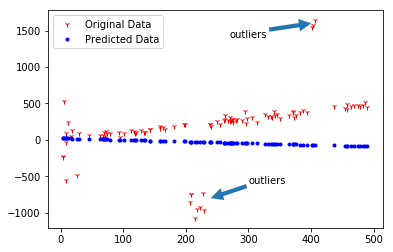 For the sake of this illustration, let us artificially introduce Gaussian noise (i.e. noise with the probability density function equal to the normal distribution) and add that to the original sample \( y \). Note that this noise will only bring minor jitters to the actual line. So, to make things worse, let us introduce some outliers manually. For instance, I chose to change all values of \( x <= 40 \) to be magnified by a factor of \( 10 \). Now, let us see how the final artifically constructed data looks as compared to the originally clean line $y=x$. Looks like we have done a fair amount of damage to the data. 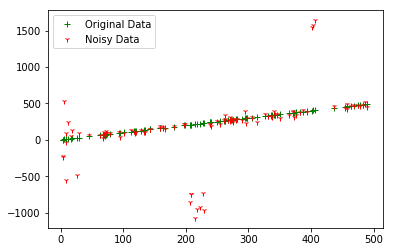 Remember that we added noise to data which had \( m=1 \) and \( c=0 \). Great! We have a coefficient and the intercept. That seems way off. Let us see how our predictions look as compared to original data. Oops! That is an awfully skewed line and will not be an accurate predictor of the data we started with. As you might have guessed already, this problem aries because of the outliers labelled above. Estimate parameters for the model of choice using the sampled subset. Calculate the error for all remaining samples using an error function. Count number of inliers i.e., all samples below a given threshold error. Repeat the above to find the best model. While there is nothing complex about the algorithm, it is an extremely elegant and efficient idea. 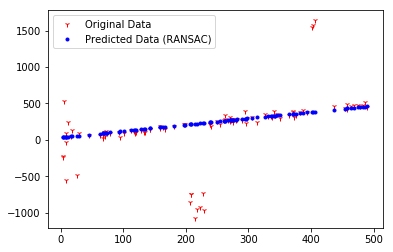 It is important to understand that RANSAC is not a regressor itself but helps improve the robustness of a given model by non-deterministically sampling subsets of data and training on them. Think of it as a more efficient alternative to k-fold cross-validation. Let us see how the RANSAC Regressor works for our problem. Wow! That looks way better than the previous result and is generally moving in a correct direction. In essence, RANSAC works because it tries out different model hypotheses and returns the best possible match after a given number of trials. In that effort, the model hypothesis which would have contained the outliers would have been outright rejected in the error thresholding step. Like all non-deterministic algorithms, we must show that this algorithms returns result with reasonable probabilistic bounds. This analysis will also expose us to the various parameters that go behind the scenes. These analyses can be used to estimate the number of trials \(k \) needed to obtain a guarantee as needed by the application on a case by case basis by simply plugging in the values. RANSAC was first used to estimate the Location Determination Problem LDP (estimating points in space to an appropriate point in image). It has become a fairly common algorithm especially in Computer Vision due to the relatively low additional computational and storage requirements. It has found regular usage in problems pertaining to 2D Homography Estimation and Pose Estimation from images where the number of keypoints generated are fairly large and testing the complete sample space for solution is practically impossible in real-time. The core idea behind RANSAC, though powerful, is still not enough for practical purposes. For instance, one of the biggest assumptions behind using the technique is the existence of outliers. Understandably, it is bound to fail when the inlier ratio \( w \) is low. Among other things, the error function to estimate whether the sample is an inlier or not will have a significant impact to the accuracy of the final model. To solve the above problems, a family of RANSAC algorithms have been proposed which I’ll leave to be explored in further reading below.